When a group of biologists realized that pumpkin toadlets had no middle ear bone, the team was stumped. That meant that these tiny, toxic frogs couldn’t hear each other’s high-pitched chirps, which is how most frogs attract mates. “We scratched our heads about how they could communicate by other means,” says Sandra Goutte, an evolutionary biologist at New York University Abu Dhabi in the United Arab Emirates. 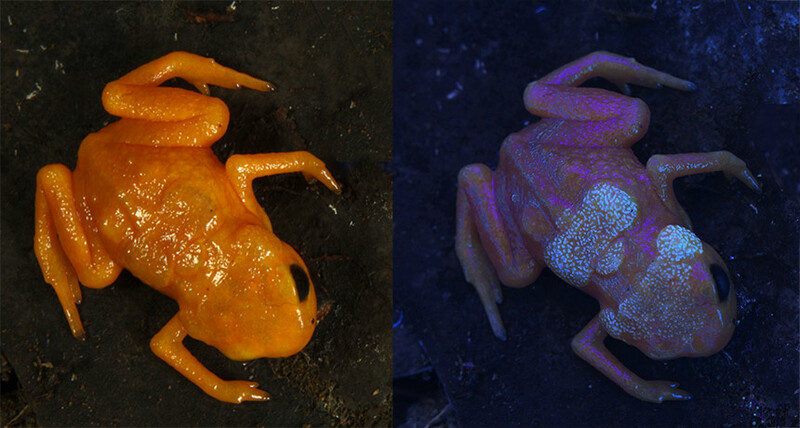 Suspecting that the frogs use a less obvious form of communication, similar to parrots attracting mates with feathers that emanate ultraviolet light (SN:1/19/02, p. 40), the researchers aimed a UV lamp at the frogs’ neon orange skin and saw a pattern glowing in blue. “I couldn’t stop smiling for the whole day” after discovering that the frogs had glowing bony plates just beneath the skin on their heads and backs, Goutte says. The finding, reported online March 29 in Scientific Reports, marks the first known case of an amphibian showing bone fluorescence. Among terrestrial vertebrates, only chameleons have been found with this trait. Skeletal and tissue comparisons of two toadlet species — Brachycephalus ephippium and B. pitanga — with a third frog relative revealed that the plates were skin that had turned to bone. All bone fluoresces under UV light, but usually layers of skin, muscle and fat block that light from getting out. The skin covering the frogs’ plates, however, is thin enough for the light to be seen, and it lacks pigmented cells called melanophores that help block UV light from getting through skin. These traits may allow the frogs to communicate with fluorescence, possibly for luring potential mates or warning would-be predators, the researchers suggest. The frogs’ eyes would have to be extremely sensitive to pick up such cues. The plates wouldn’t glow brightly in the frogs’ native forests of southeastern Brazil, where little UV light passes through the tree canopy, the researchers showed. The team is conducting behavioral studies with the toadlets to try to pinpoint the function of the fluorescence.